Now, with our NEW interactive map, you can find your nearest bus stop - wherever you may be! 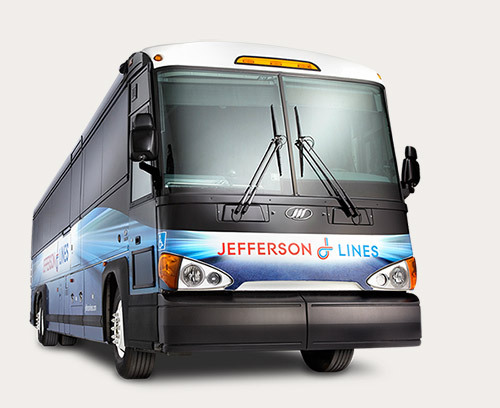 Just enter your zip or city/state to find your nearest Jefferson Lines bus stop today. Save Money - Travel More! Save up to 50% when you book at least 21 days in advance. Start traveling and save on our affordable bus tickets today. This year Jefferson Lines is celebrating 100 Years! That's 100 years of reliable and innovative transportation. Learn about Jefferson's history and its participation in the world around us. We look forward to commemorating this monumental event with you and continuing to provide Your #1 Bus Experience for 100 Years. Here to 100 more! Jefferson Lines has been Your #1 Bus Experience for 100 Years. We provide daily bus service to 14 states across America’s Heartland with affordable prices and convenient schedules. Through partnerships with other bus companies, we connect you to thousands of destinations across the United States, Canada, and Mexico. We also provide charter services for a variety of group travel in the Minneapolis, MN and Billings, MT areas. We have the experience, professional drivers, and comfortable coaches to provide you or your group with an enjoyable trip. If you’re looking for affordable and convenient bus travel, look no further than Jefferson Lines. Start planning your trip and buy bus tickets online now!